I’m not advocating you forget about the news and the challenges and struggles and more that people and society are undergoing. But maybe, instead of focusing on them, you’d be best off if you strove to appreciate what you have, if you strove to appreciate those around you, if you strove to appreciate and make the most of your life. But I do believe we have a choice to make. How do you want to feel? It’s easy to sink into the morass and feel like crap. How many people are starving? Or homeless? Or hopeless? And if they are like that, why do I deserve to be happy? Isn’t that selfish of me? No. It’s not. In fact, thinking that your unhappiness actually helps someone else who has real problems is selfish. You can donate money, write a letter to a politician, volunteer, etc. Those are meaningful actions that will have some impact. You can be empathetic. You can be sympathetic. But being miserable on someone else’s behalf is pointless. My son asked me to write something good. To be happy. I think BR gave me great advice. I’m not a big smiley, happy-go-lucky guy. But we can all find something good in our lives, something that makes us happy. Don’t tell me you have nothing. I know you have something good in your life. There is something in your life that makes you feel fortunate. Did you smile or feel good over something in that list? Which one? Or was it something else? What’s on your happy list? I have so much in my life to be happy for, so much good. BR, SJ, Ms. MMK are all part of that. The good things in life are in front of you. Appreciate them. Celebrate them. Last week was parent teacher visitation at the children’s school. We (Ms. MMK and I) got terrific reports about both of our children. Yesterday, my boys got a present from their Judaica studies tutor. The tutor went on to tell my wife how both boys were so well mannered. Both children said thank you and did not open the present till after their session was completed. Neither of these things is earth-shattering. So what! 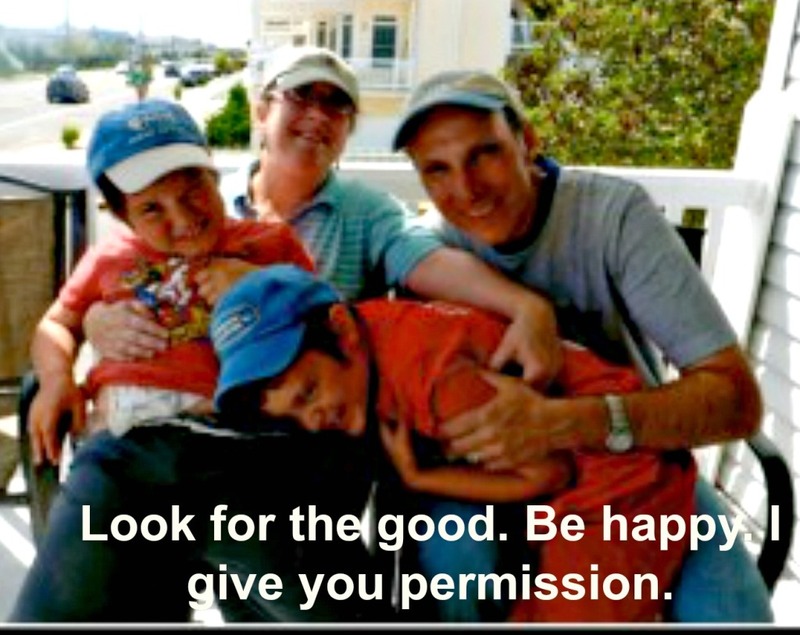 Look for the good. Be happy. I give you permission. Thanks for the reminder BR. This entry was posted in Family, News and tagged appreciate, Children, good, happy, News by lardavbern. Bookmark the permalink. I love it! I’m on a mission to find the happy in my own life. Thank you for the reminder! Glad you do love it. You gave me the reminder as well. Good luck with that mission. No, thank you. Is it me or is it easier to find on some days than others? I think we make the choice to be happy or not. Attitude has a lot to do with it. I’d be really happy if I didn’t have to go back to Toys R Us today for the second time in two days because I forgot to buy a birthday gift for a five year old when I was there yesterday. I don’t envy you. I hope it was not as bad as you expected. For years and years I’ve lived a life of Gratitude, it makes a world of difference when you spend the day being thankful for all that is around and all you have. It’s easy to be happy with all of those reminders! People could learn alot from you! Absolutely. With all the horrible stuff that goes on in the world, if we don’t take time to focus on the goodness in our lives, no matter how small the good thing may be, our hearts will get weighted down for sure. 100% agreed. The news has been terrible lately! Your reminder that being miserable on someone else’s behalf is pointless is exactly what I needed to hear today. I’ll try to focus on the positive and go to the bookstore for a few hours. That’s always good for a pick-me-up! Glad I could help. I think we all need that reminder once in a while.